This collection has been put together to help me design a historically accurate English 16th century dress. Rather than rely on the standard costume references I'm trying to approach these gowns with a fresh eye, based on how they appear in contemporary paintings, sketches, miniatures and monumental brasses. I've tried to find good quality reproductions, but of course much is lost from photo to print to scan. 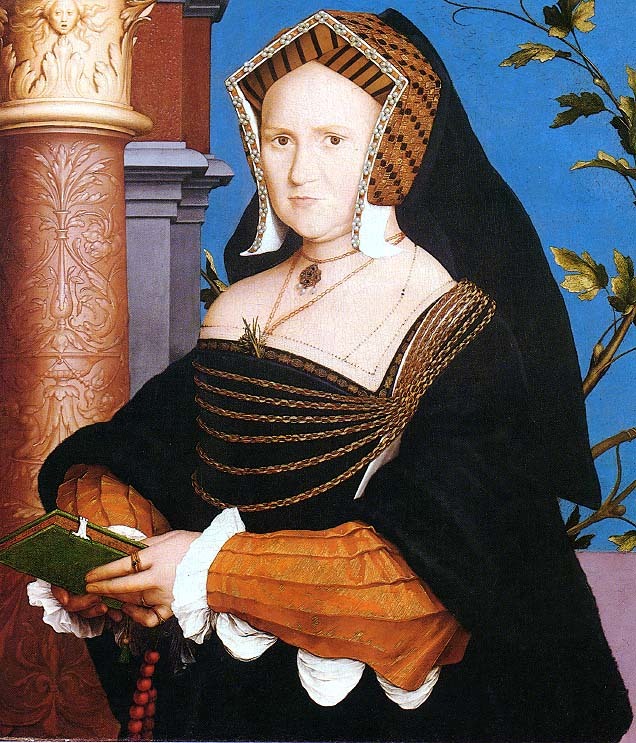 However, the Tudor painters, particularly Holbein, exhibit a wonderful eye for detail that, until someone publishes examples of actual garments, I'll decide to trust. The images are listed in no particular order, though they are roughly chronological. See below for sources. You may also be interested in Tudor Gable Headdress: A Portfolio of Images and Tudor Bonnets, Men and Women: A Portfolio of Images. Other non-Tudor collections include 15th Century Female Flemish Dress and Men's and Women's Work Clothing (15th/early 16th centuries). There is speculation in this page about an apparent white band of fabric that passes over the shoulder. You may be interested in some Preliminary Musings on the Mysterious White Band that I've begun to collect. 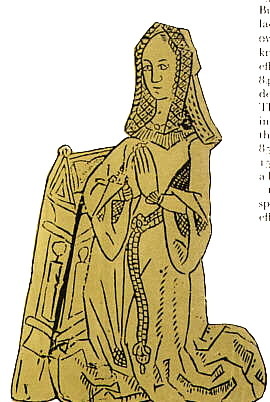 Early gable headdress, front opening gown, narrow sleeves. Appears to be deep brown or black velvet gown. A close look at the center front of this gown (bodice detail) leads me to believe this is a kirtle with the neck edge trimmed with gold scallpo shells, under a gown edged with piping or cord. One of the decorative gold scallop shells in the bodice detail is slightly obscured by the cording. A closer look at the image as reprinted in the book suggests the scallops are on a black piece of non-pile fabric. There appears to be a line of demarcation between the fabric on which the shells are affixed, and the sleeves and bodice (see this detail where the brightness and contrast have been heightened). Difficult to tell from this reproduction. 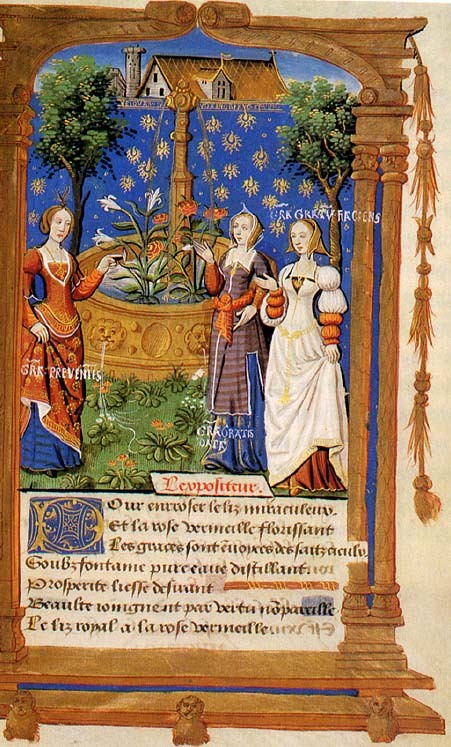 The manuscript contains descriptions and illuminations of the tableaux devised by Pierre Gringore for Mary Tudor's procession to Paris to marry Louis XII. Not necessarily meant to represent actual garments, but interesting nevertheless. "Spinster. . .Note the flowing hair--the method of denoting a spinster." "Flemish work." The room interior and naturalism of the design is noted by Norris as German or Flemish in origin. (p. 79) The pointed peak of the headdress, replicated in the children, is also interesting. 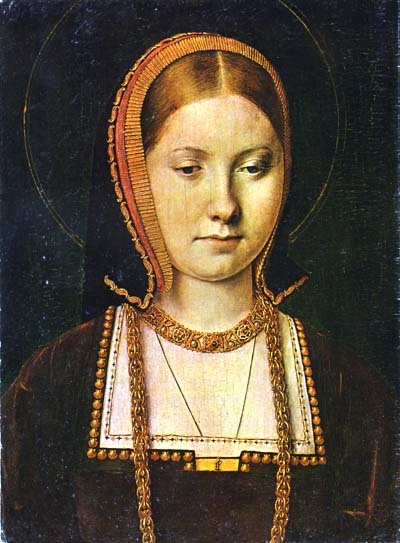 Looks rather like the image by Holbein below. By an unknown, and not very detail-oriented, artist. The question for this image is: what is the white band from her shoulder alongside the bodice? 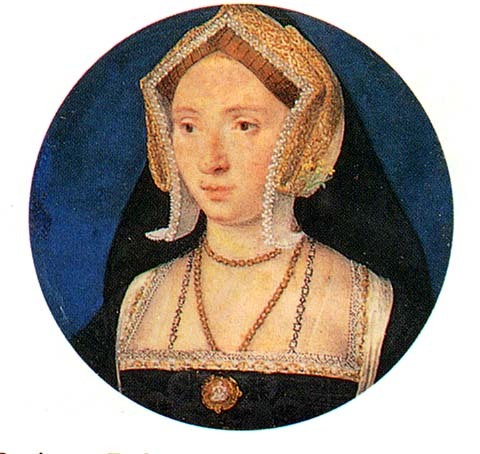 This is an early miniature, recently suggested by Sir Roy Strong to be that of Anne Boleyn. An interesting contrast to the usual copies that show her at a later age and in a French hood. There's that mysterious white band again. 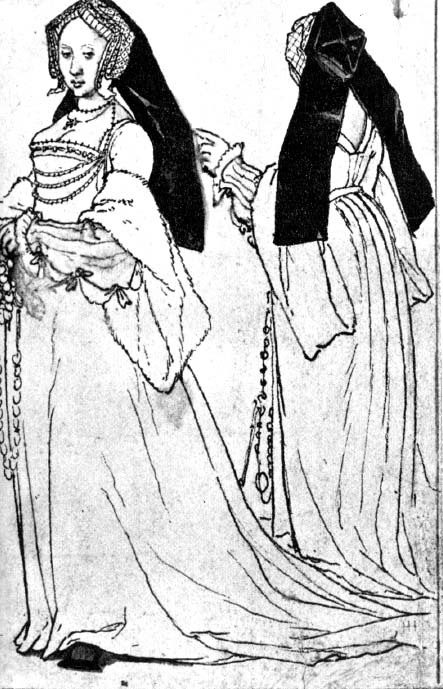 Front-laced gowns, pleated undersleeves (see Lady Guildford), two non-gable headdresses--so many intriguing details. If only the original painting had survived! 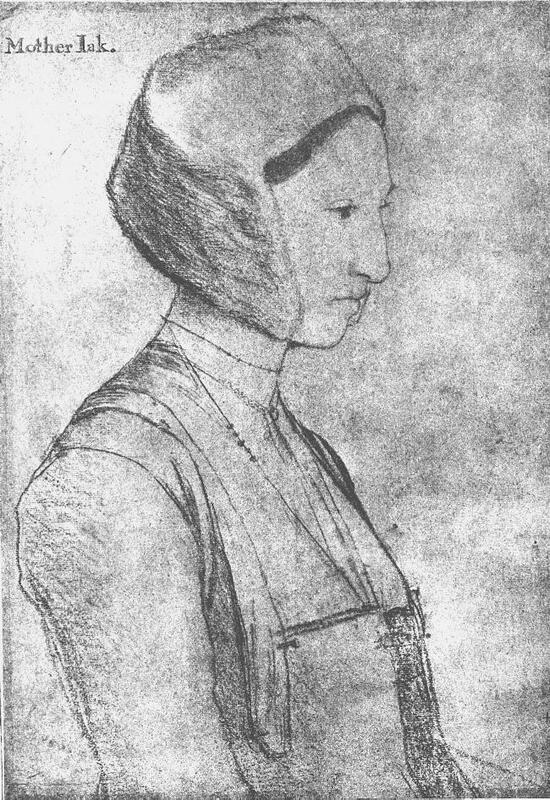 Despite the inscription, this is now considered a sketch of Thomas More's second daughter, and the preparatory sketch for the family group. Clearly shows front lacing, shoulder seam and set in sleeve (and the white thing). Notice the white band appears to terminate at the ribs. 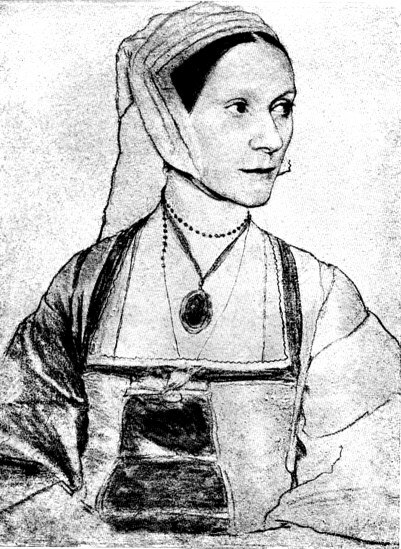 Mislabeled as Mistress Jak, Edward VIs nurse, this image has since been dated as belonging to the work done during Holbein's earlier visit to England in the late 1520s and is considered to be a sketch of Margaret Grigg (see similarity to figure in "Lockley" below.). Though the quality of the scan is poor, it is clear enough to see that the "white thing" appears to contain pins, and appears to end above the waist. Not many details, but some intriguing bits about the shoulder. 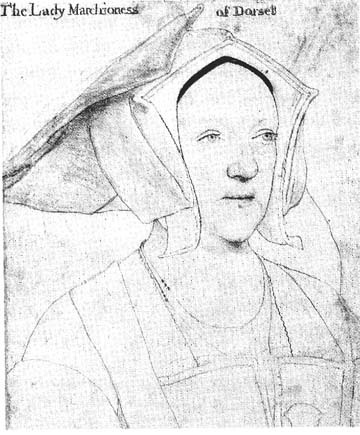 This is considered to be a preliminary sketch for the portrait of Lady Guildford. 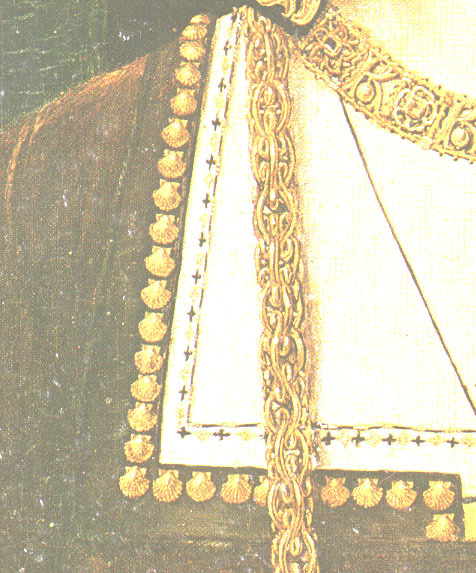 Note how Holbein, in his typical fashoin, has sketched in just enough of the details to be a reminder, such as the chain links and trim pattern. The white band again, this time under the chains which appear to be at least temporarily affixed to the bodice. This suggests the white thing is not just a loose bit of shawl. In this version of the famous lost painting Elizabeth Dauncey has traded places with Margaret Grigg. This is good news because Margaret's sleeves are not full and her skirt is tucked up! Her overskirt appears to be hitched up with a cord attached to her belt. The cord is not white and does not appear to originate at the white band. Nor does the white band continue below the bend of her arm. This is barely visible in the copy I have and not at all in the scan. I'm still looking for another copy to scan. 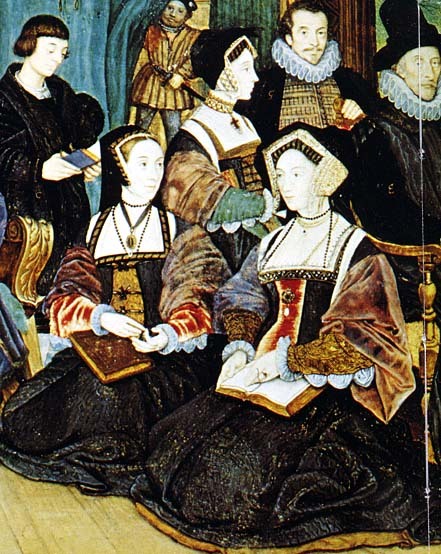 This painting is a copy by another painter of the lost Holbein original, with additional family members added. Because of the date this painting was done, clothing details, especially colors, are not reliable. 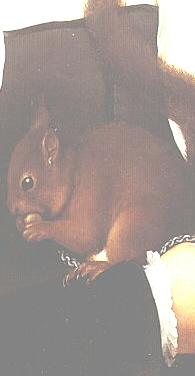 Detail of Margaret Roper from 1593 version of Holbein painting. Again, colors/details not reliable but there's that white thing again. "The work of a local craftsman, it has a naive charm. . ." Gathered chemise, front opening, no waist seam. 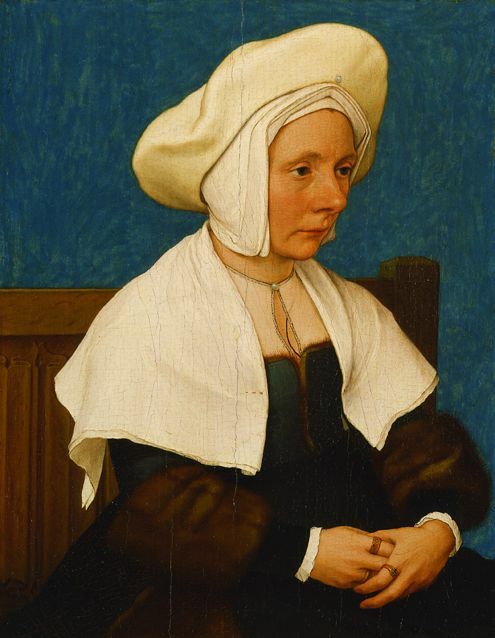 Portrait of a Woman, c. 1532-35, Holbein. A front fastening gown with trim with fur lining. Linen shawl pinned on. Linen cap and wool hat. Gold pin heads on the side and what may be a lined partlet. 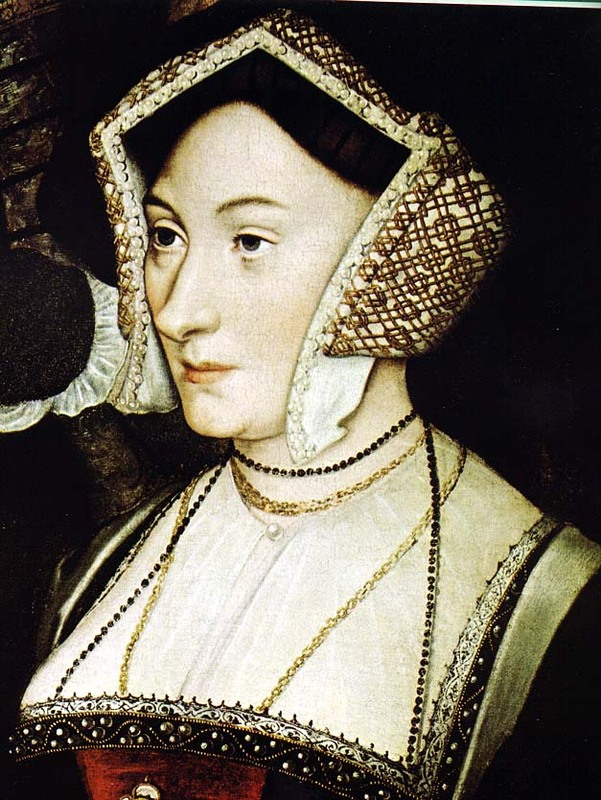 Displays the same folded linen shawl and interesting headwear that is similar to some of Holbein's non-English portraits. High-necked blackwork chemise with ties at neck instead of button. 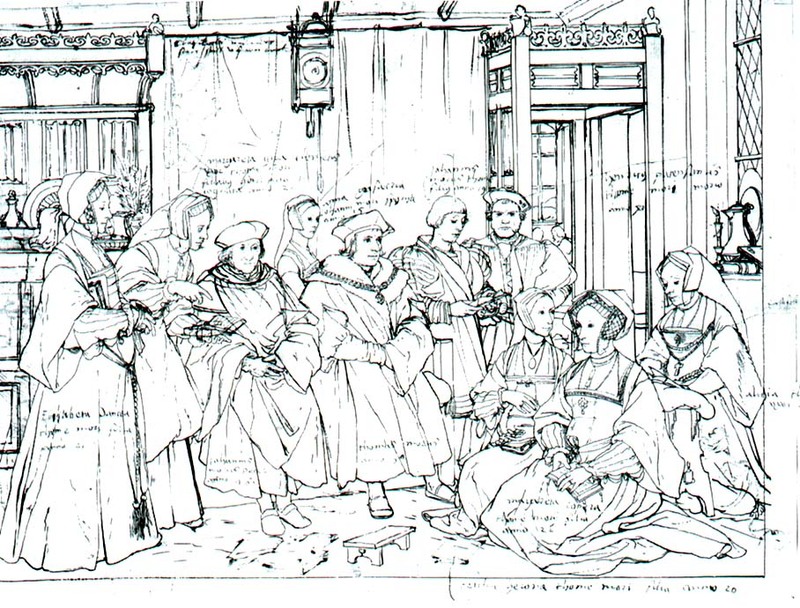 The preliminary sketch for the famous painting, below. See additional notes about this drawing and the paintings below. 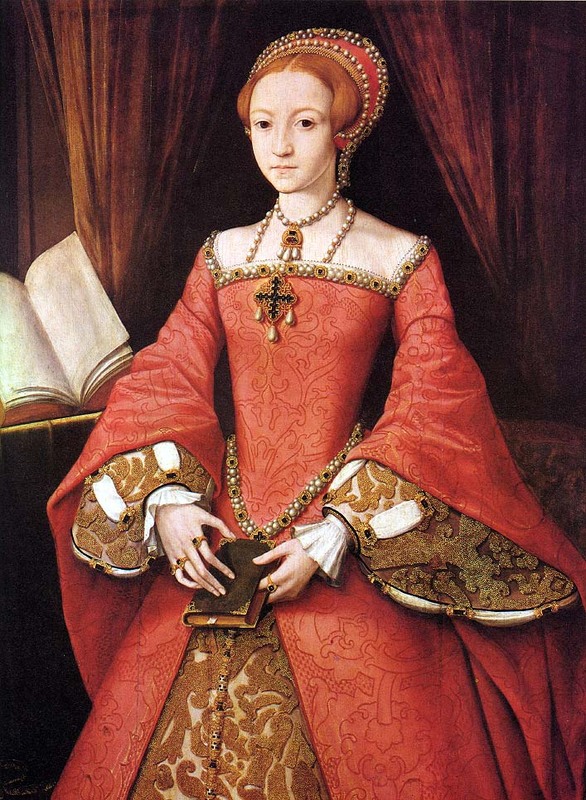 The famous red dress that supports the "stomacher pinned over front lacing" theory (see the gold pins?). Note the undersleeve and underskirt fabrics. Also see the sleeve detail and the blackwork detail. 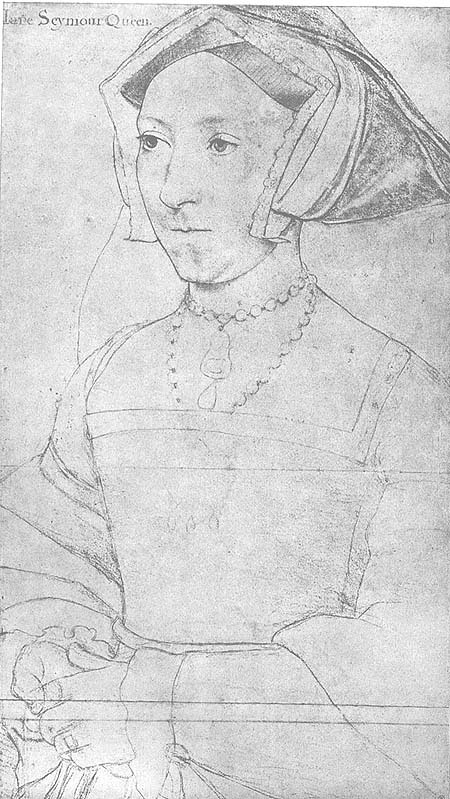 Also based on the drawing, above, this portrait copies the sketch details of the jewelry, show a different blackwork pattern at the sleeves, and uses the pleated undersleeve similar to that of Lady Guildford, instead of the cloth of silver depicted in Holbein's portrait..
Margaret, Marchioness of Dorset, before her death in 1541, Holbein. 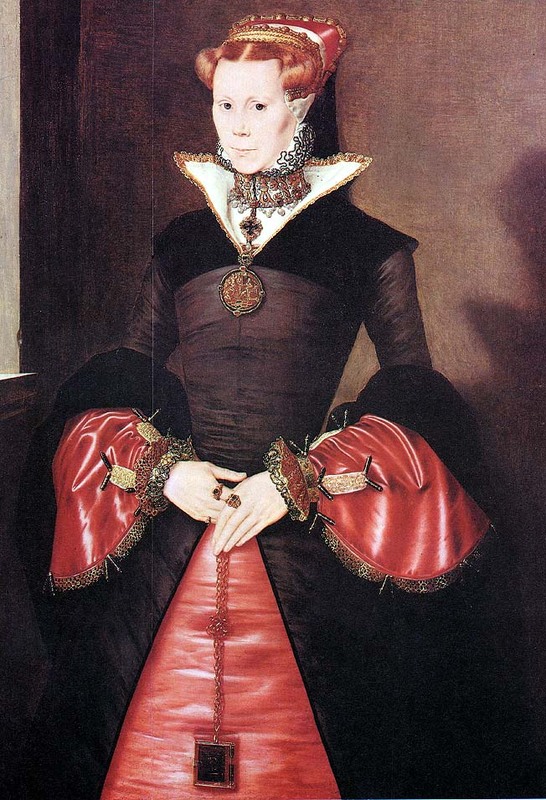 One of Elizabeth I's godmothers. 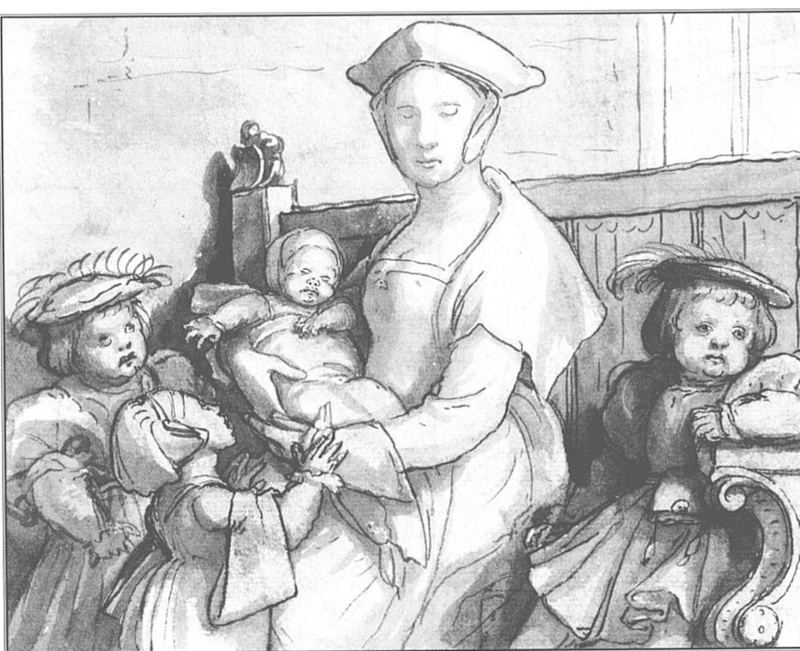 Sketch probably done at or near the time of Elizabeth's christening. A front fastening gown with trim? Lofts labels this a "Holbein drawing of a Court lady of the time. 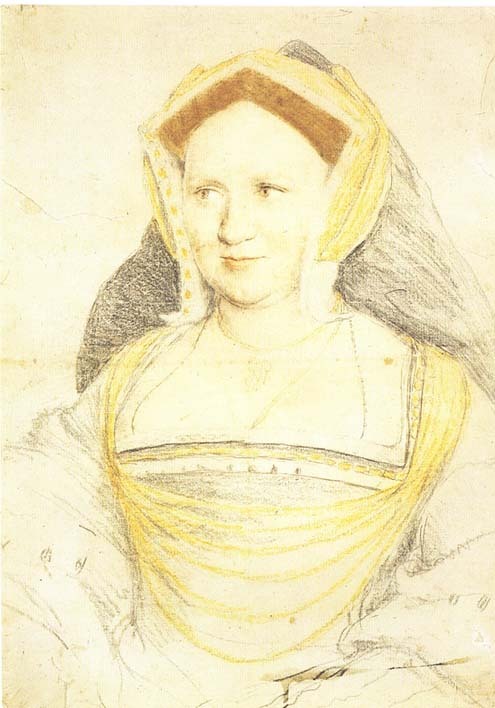 This image also appears in Boucher's 20,000 Year of Fashions as an English Burgher's wife c. 1540. This picture is very interesting because it is finally a full length view of someone with the mysterious white band. There is a belt device used to hold up the lady's skirt. Unfortunately it does not appear to be connected to the white band. Even though this is a fairly good quality image, an enlarged detail doesn't really help. According to someone who has seen the original at the Bodleain, the entire image is very small, so I suppose we cannot hope for any greater detail. The famous "back views." Are we looking at a v-back or a squared-off v with an underdress? Where does this gown close. Are the lines at back the seam lines of a placket and hidden closure? There appears to be no closure in the front, and if there is one hidden by a stomacher there is no evidence of an opening or split skirt below the waistline. 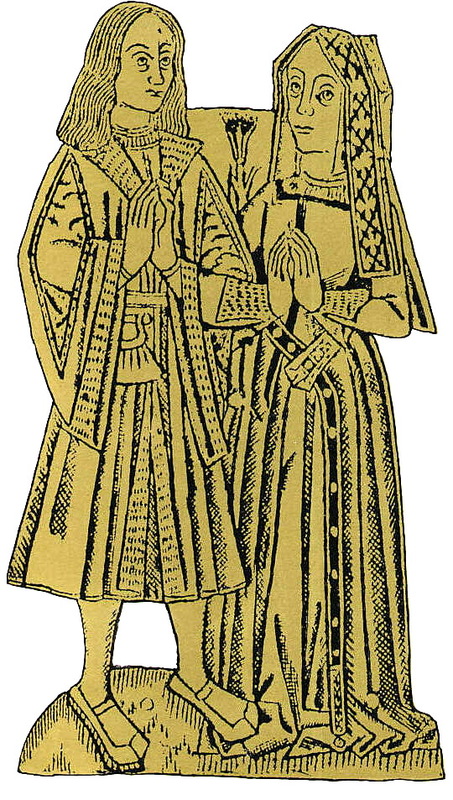 From a monumental brass. 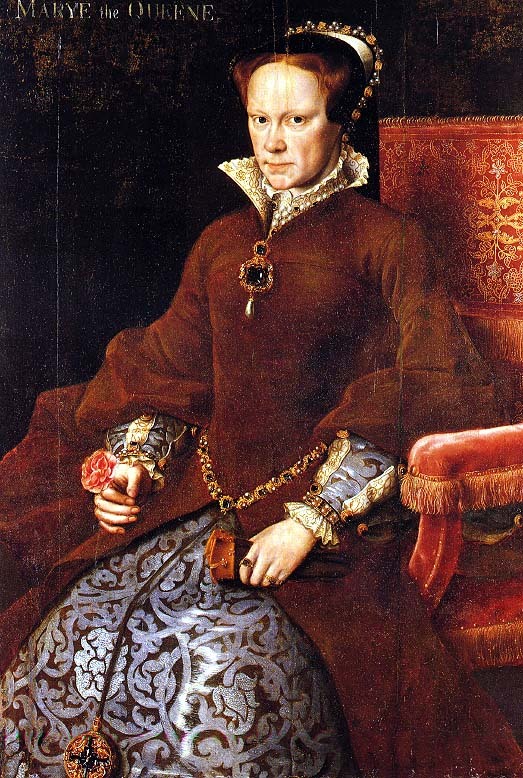 "Note the large paternoster beads attached to her decorative belt by a three-rose buckle. This buckle probably symbolizes the three sets of five mysteries in the Rosary devotion." Trim at the neck and hem of the undergown. A bit of the underskirt might be visible and it appears to match the undersleeves. Of interest is the trim around the neckline which matches the trimming of the hood. It continues across the shoulders, suggesting this is not a stomacher. How would this dress lace? 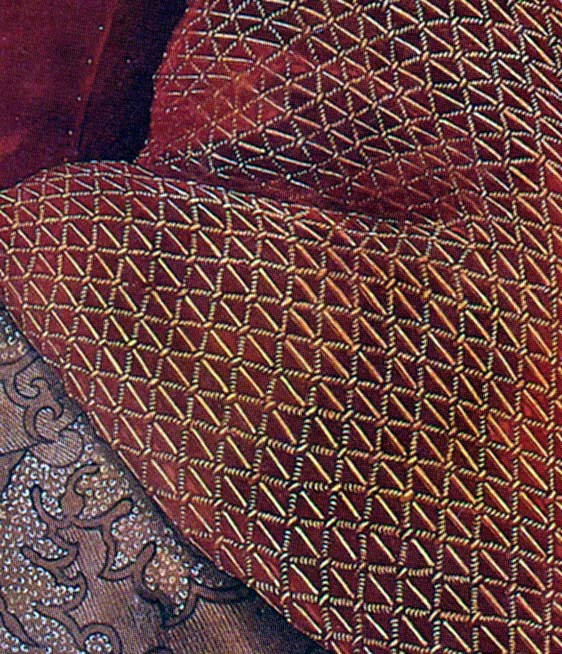 As can be seen in this detail, this appears to be a front fastening gown. The modest sleeve has a deep cuff of the same velvet that appears as trim at the opening. Is it a partlet or chemise? Linen or silk? Also see the center front detail. 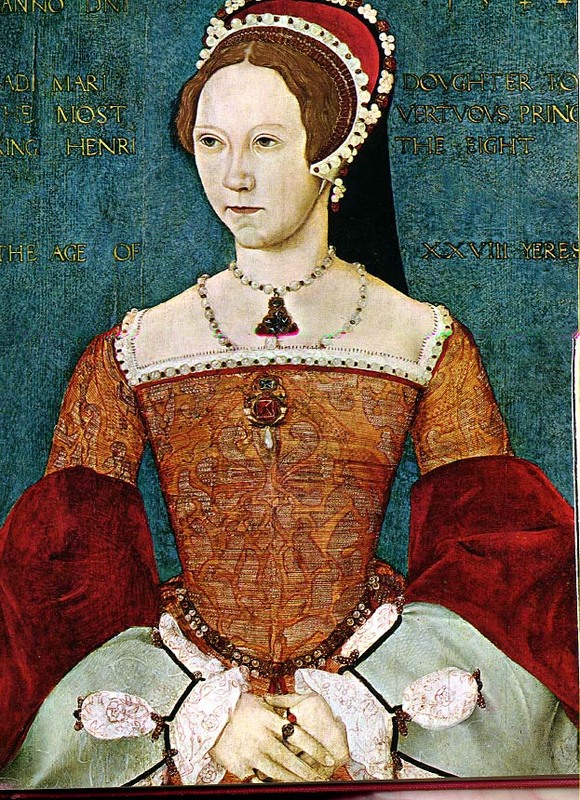 The Tudor icon of a queen. The undersleeves match the undergown or forepart. The waist is rounded and there is a bit of gap at the center front point of the skirt where it meets the waist, suggesting that this may be a front-laced gown with a stomacher. 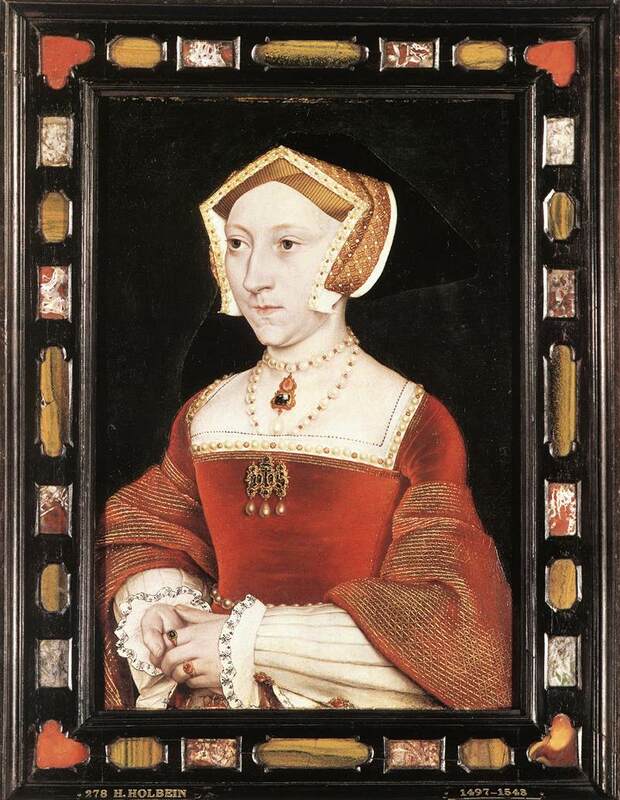 As this image depicts Jane Seymour, and was painted after her death, this may just be the standard "Jane Seymour" iconigraphic style. 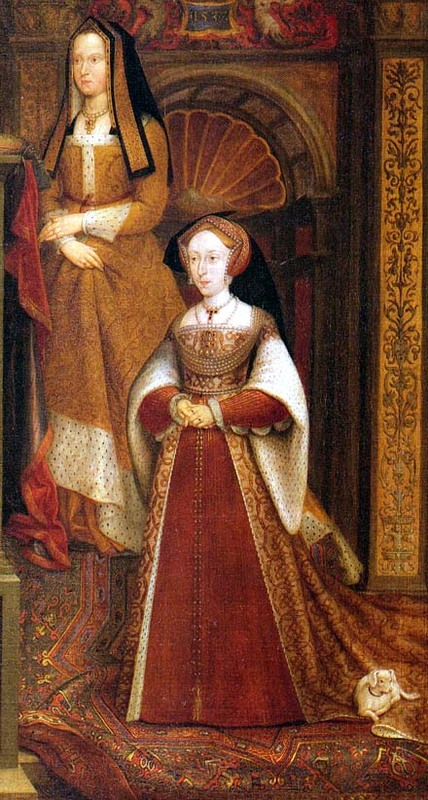 However, Elizabeth's gown, though you cannot actually see the waist, appears to be the same style. An example of the sleeve head appearing to be attached directly to the bodice armscye and of the false undersleeve material matching the underskirt. The pointed waist and apparent absence of a center seam make it difficult to imagine this gown would have a front closure, hidden or otherwise. 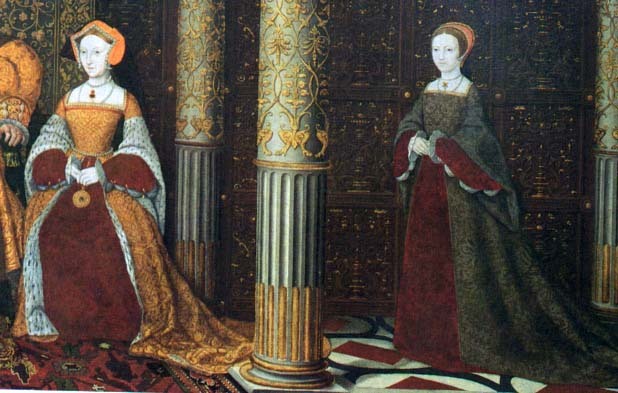 Elizabeth of York and Jane Seymour: detail from the Whitechapel Mural, copy by van Leemput after Holbein, 1667. 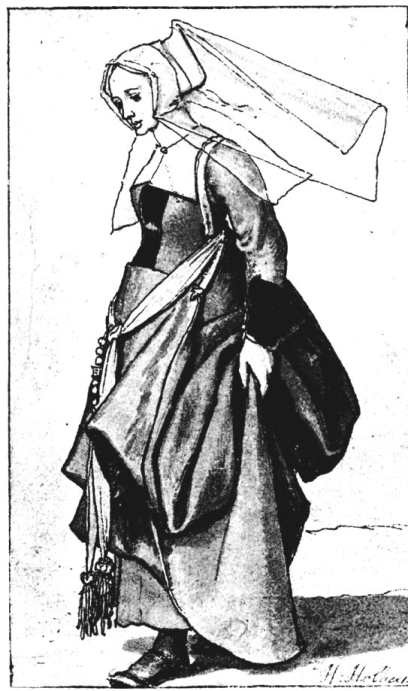 Tudor dress but with a 17th century vertical/conical silouhette. Bätschmann, Oskar and Pascal Griener. 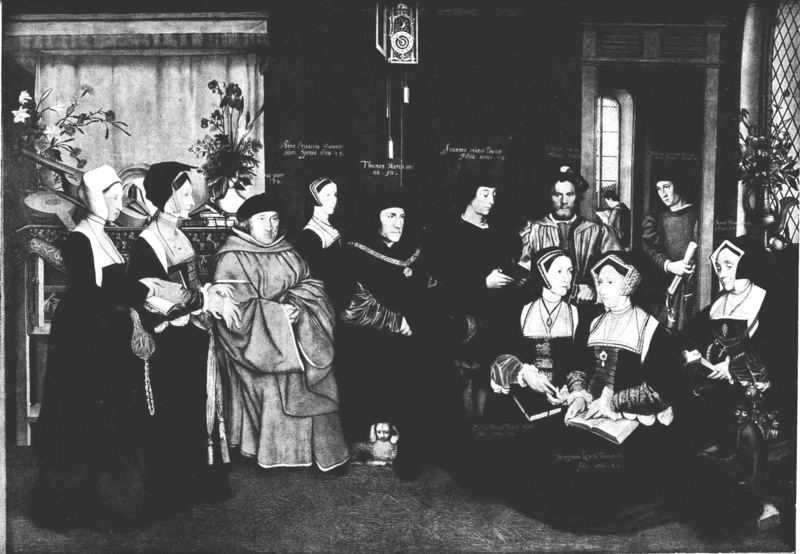 Holbein.Princeton: Princeton University Press, 1997. Chamberlain, Arthur. Hans Holbein the Younger. New York: Dodd, Mead and Company, 1913. Ganz, Paul. 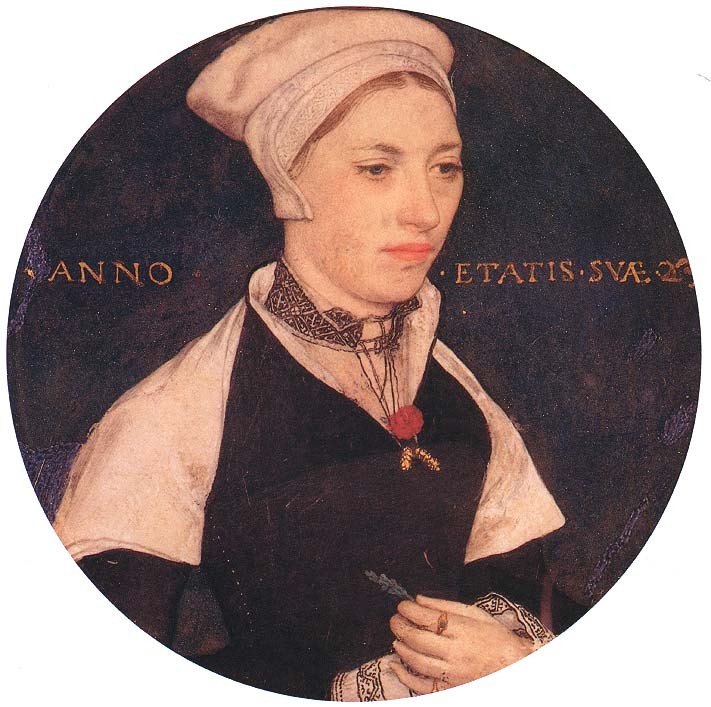 The Paintings of Hans Holbein. London: The Phaidon Press, 1950. Hearn, Karen, Ed. Dynasties: Painting in Tudor and Jacobean England, 1530 1630. New York: Rizzoli International Publications, 1996. Langdon, Helen. 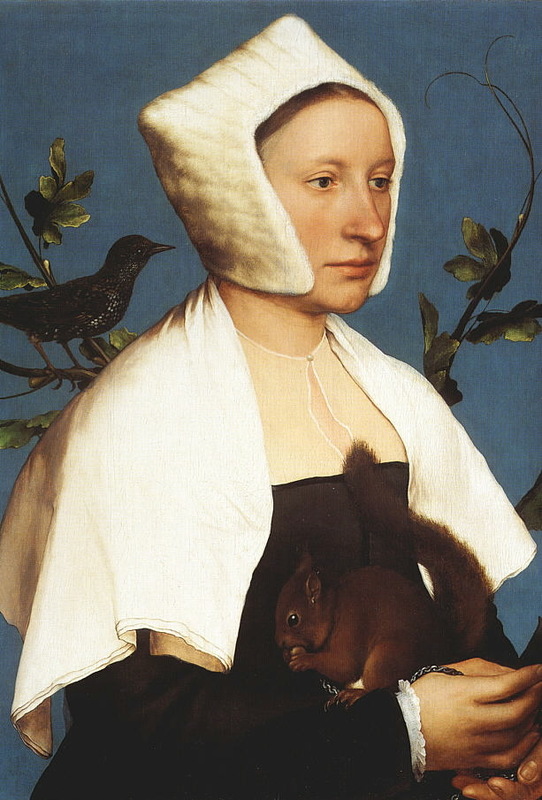 Holbein. London: Phaidon Press, 1993. Lofts, Norah. 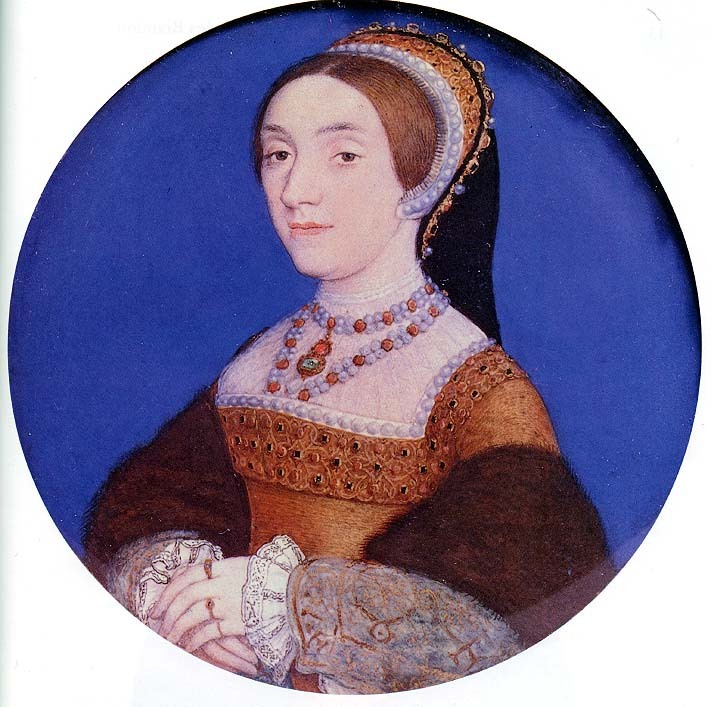 Anne Boleyn. New York: Coward, McCann and Geoghegan, 1979. Norris, Malcolm. Monumental Brasses: the Craft. London: Faber and Faber, 1978. Pierpont Morgan Library. 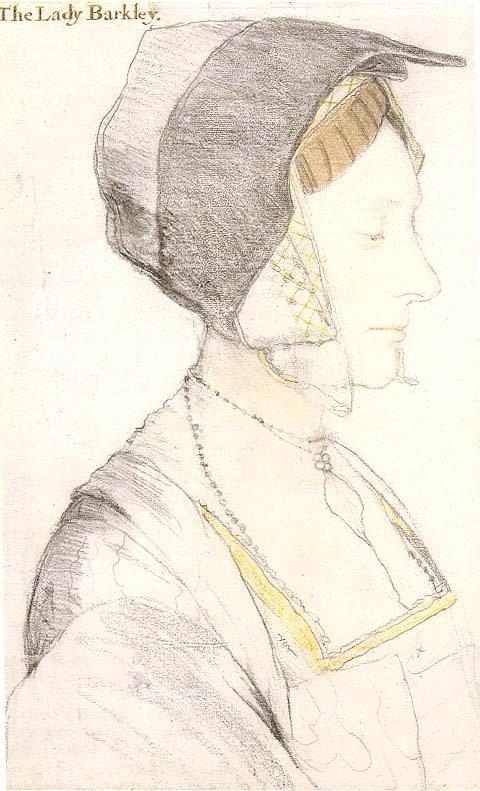 Holbein and the Court of Henry VIII : drawings from the Collection of H.M. Queen Elizabeth II, Windsor Castle. New York : Pierpont Morgan Library, c1983. Rowlands, John. 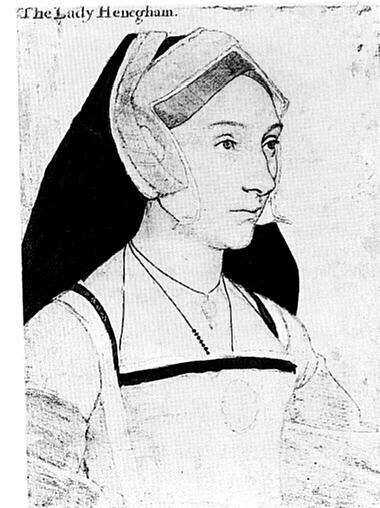 Holbein: The Paintings of Hans Holbein the Younger. Boston: David R. Godine, 1985. Rupp, Gordon. Thomas More: The King's Good Servant. London: Collins, 1978. Sim, Alison. 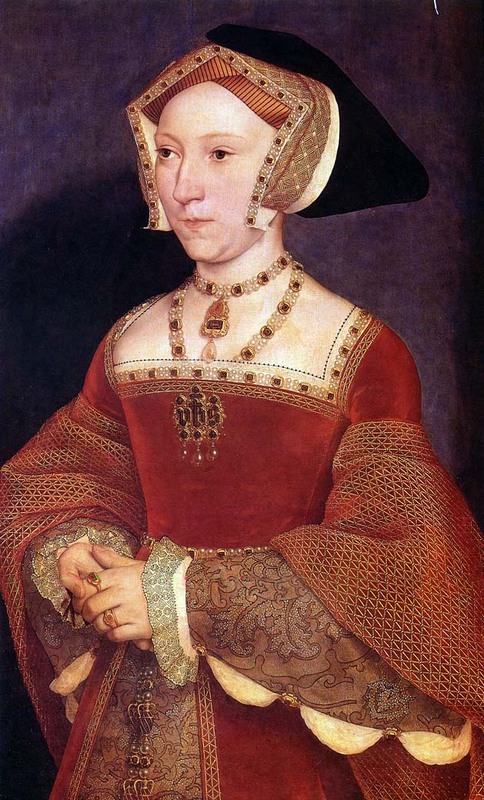 The Tudor Housewife. Montreal: McGill-Queen's University Press, 1996. Starkey, David, Ed. Henry VIII: A European Court in England. New York: Cross River Press, 1991. Thurley, Simon. The Royal Palaces of Tudor England: Architecture and Court Life 1460-1547. New Haven: Yale University Press, 1993. Trivick, Henry. The Picture Book of Brasses in Gilt. New York: Charles Scribner's Sons, 1971. Warnicke, Retha. 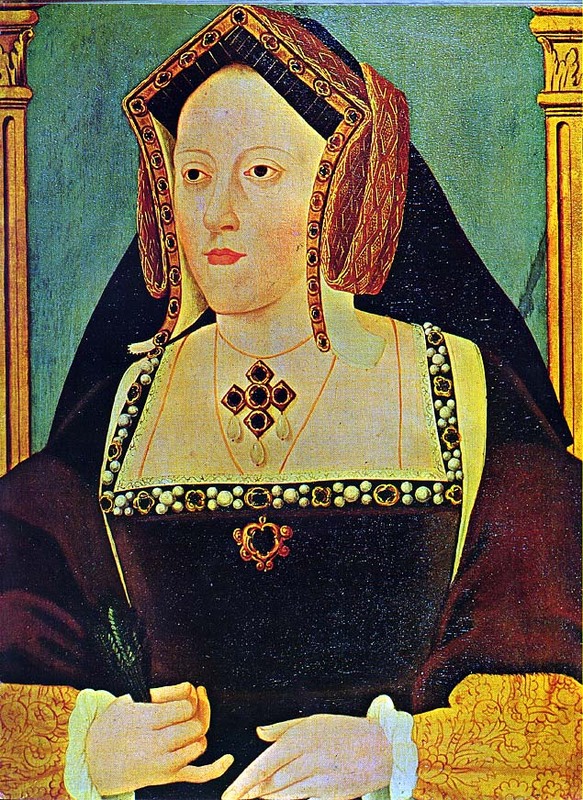 The Rise and Fall of Anne Boleyn: Family Politics at the Court of Henry VIII. Cambridge: Cambridge University Press, 1989. Williams, Neville. Henry VIII and His Court. New York: The Macmillan Company, 1971.
c. 1998, SCA working pages.